I wrote a long piece a couple of years ago, about why I refused to review the third Transformers movie: because the first two sucked, because Michael Bay is the Antichrist, because life is too short to spend watching make-believe computer-animated robots fight each other. I could go on and on. 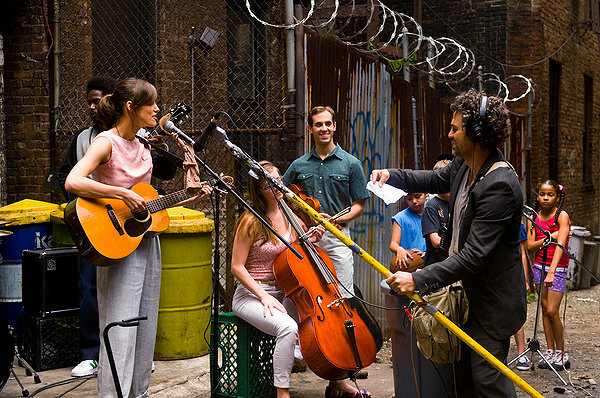 Begin Again comes from writer-director John Carney, who burst forth with Once a few years ago. This film, which stars Keira Knightly and Mark Ruffalo (among others), captures the same blend of wistful emotions and life-affirming musical energy as that 2006 hit. Told in complicated chronology, which jumps back and forth in time over the course of a couple weeks, the film centers on Dan (Ruffalo), a floundering record executive, and Greta (Knightley), a songwriter with a failing relationship. Their paths cross one night at a Brooklyn open-mike, where she sings an original song that knocks him out. We then see their recent lives to that moment: Dan, losing his job at the record company he co-founded, for various divorce-driven bits of acting out; Greta, who followed her pop-star boyfriend (Adam Levine) to the U.S. from the U.K., dealing with their breakup. She wrote the song about him -- but it hit home with Dan, who decides he can turn it into a hit and her into a star. The rest of the film focuses on his execution of an idea: recording her songs with a live band in strange locations all over Manhattan. They play and sing on rooftops, in apartments, even on rowboats in Central Park. It's a cute gimmick, mostly offering visual novelty moments by setting performances of the songs (mostly by Gregg Alexander, Carney and cowriters) in unusual environments. In other words, it's a musical, but they aren't bursting into song spontaneously. The heart of this film is, in fact, its heart -- that same examination of the intimate fulfillment from making music well with another person that was at the center of Once. Indeed, it was originally called Can a Song Save Your Life?, a title that really does capture the urgency of the film. The will-they/won't-they romantic aspect of the plot is poignant and more fleshed out than in Once, though that's not necessarily a positive. The sense of longing that pours from both Knightley and Ruffalo is nicely calibrated between the search for love and the love of pursuing the muse. It's a sweet, engaging film which, if a tad too shaggy, is a warm, funny change of pace from most summer fare. Whitey: United States of America v. James J. Bulger: Joe Berlinger may be our premier true-crime documentarian (though he has many other arrows in his quiver) and, with this film, he has bitten off a bitter, complicated tale.